Why study arbitration in Paris? One of the most attractive and important international arbitration venues worldwide thanks to the presence of the International Chamber of Commerce’s Court of International Arbitration. The most important law firms specialized in International Arbitration and many of the most renowned specialists are based in Paris. Why study arbitration at Sciences Po Law School? Founded nearly 150 years ago, Sciences Po stands out as a world-class university with internationally-recognised degrees and research, a multicultural community and a worldwide network of partners. 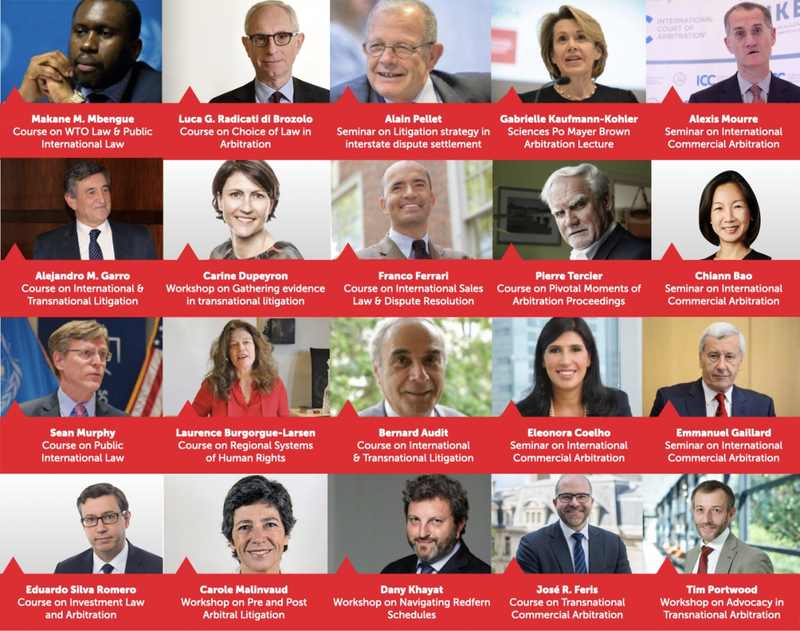 Sciences Po Law School (SPLS) has developed a strong reputation in matters related to international economic law, with a particular focus on all mechanisms of international dispute settlement. SPLS's teams excel in international moot competitions around the world and SPLS has been organising its own international moot competition for 14 years. Many international arbitration related activities are organised every year with the participation of the most outstanding specialists from all over the world. What will you study in this LLM? The LLM offers an extensive training in theoretical and practical aspects of arbitration and dispute settlement. The core matter of the program will be the study of transnational arbitration in all its forms. The program will also cover other mechanisms of international dispute settlement. These include judicial and non-judicial means of dispute resolution such as litigation before the International Court of Justice, at the World Trade Organization (Panel and Appellate Body), Human Rights Litigation (e.g. European or American framework). In addition, the program will offer an insight into litigation before domestic courts, recourse to mediation and online dispute settlement. Ultimately, the program will not exclusively focus on "procedural" tools governing dispute settlement. "Substantial" lectures will offer an insight into public international law, international contracts law, private international law, energy law, international investment law and the protection of human rights. The combination of these "procedural" and "substantial" insights will adequately prepare students to act before the extraordinary variety of tribunals and courts that exist in the world today. Students in the program (20-25 maximum each year) will be offered a series of small-group courses (intensive mandatory classes as well as elective courses) to further intellectual and professional exchange, workshops (on practice skills) entirely taught in law firms and at the ICC International Court of Arbitration, conferences, internships, and participation in international moots. All in all the LLM offers a unique opportunity to immerse in the transnational arbitration network. The high-level education received during the programme, enables students to be extremely competitive to get positions in international law firms, arbitration institutions and international organisations. The Faculty comprises the members of the two governance bodies joined by other renowned scholars and practitioners from all over the world. On the December 5th 2018 the first conference of the Arbitration X Technology saga, was held in Paris, at the premises of Sciences Po Law School. Practitioners, scholars and students of the international arbitration community were gathered to present, discuss, and argue on the stake of arbitration amidst the technological evolution. The conference was organized by the Sciences Po Arbitration Society (SPAS), under the framework of the LL.M in Transnational Arbitration and Dispute Settlement (T.A.D.S). On 21 September 2018, in the LLM inaugural lecture “International Arbitration: Past, Present and Future”, Gary Born gave an overview of the history of international arbitration and address contemporaneous and future challenges that the practice of international arbitration faces. On 23 May 2018, the Center of Transnational Litigation, Arbitration and Commercial Law of the School of Law of NYU and Sciences Po Law School held a joint conference on Soft Law in International Adjudication, under the direction of professors Franco Ferrari and Diego P. Fernández Arroyo. Fully taught in English, this one-year programme is designed for candidates with a graduate degree in law who are seeking to immerse themselves in a challenging university environment and gain further expertise or new horizons in arbitration and international dispute settlement. The LLM is a full-time programme, running from late August to the end of August of the following year. "It's the best decision that I have made in my career"
Candidates must hold a law degree (Master 2, JD, LL.B., or the equivalent) and a professional experience. Please note that internships could be considered as professional experience. Find out more about the admission procedure. Tuition fees for the entire programme are set at €24,000. A limited number of scholarships are envisaged.